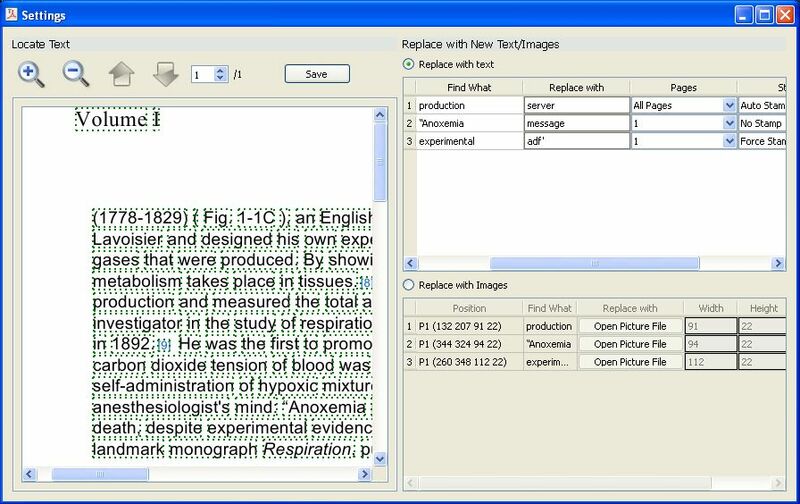 VeryPDF PDF Text Replacer does find and replace text of PDF with text or images in batches. VeryPDF PDF Text Replacer is a very simple, lightning-quick desktop utility program that lets you batch replace, change or delete multiples text in Acrobat PDF files automatically. VeryPDF PDF Text Replacer is developed for replacing text of PDF. It can replace specified text in specified positions of pages, with text or images. It can also replace all found text with given text or images for all selected PDF files in batches. A user can replace more than one text string with more than one different text string or images for more than one different PDF files. * Replace text in multiple PDF files with batch process. * Allow to specify page range to be replaced. * Replace text in specific positions and pages for all selected PDF files. * Replace text in specified position with images or text. * Customize sizes of image when replace text with images. * Replace multiple words with multiple different images. * Replace multiple words with different words in one replacement process. * Option to draw an area in PDF then replace this area by image or text. * Three replace modes in GUI version:auto stamp, force stamp and no stamp. * Two replacement modes - replace with text and cover with text. * Command line operation to replace PDF text with text and image. * Batch replace, change, remove or delete text in PDF PDF files. * Remove Some Unwanted Words in PDFs. It can remove unwanted text in PDFs easily, such as text watermark you added, before printing. * PDF Text Replace Command Line. PDF Text Replace Command line can be used as a Windows console utility that silent replace text in PDF file. How to replace text in rotated PDF file? How to erase a block of information on a scanned PDF? This entry was posted in PDF Text Replacer and tagged batch replace text, change pdf text, delete pdf text, edit pdf, find text in pdf, remove pdf text, replace pdf contents, replace pdf text, replace text in pdf, replace text with image. Bookmark the permalink.